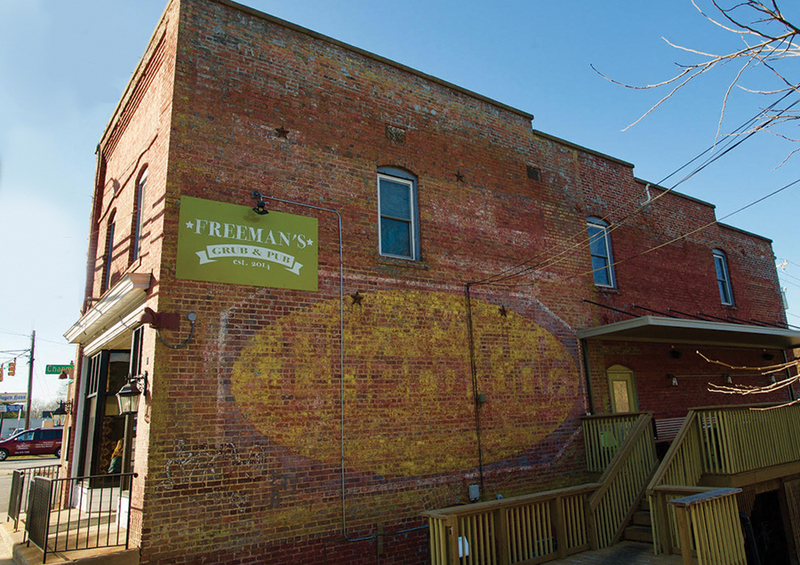 Freeman’s is a relatively recent but highly successful culinary detour for Jessie, the guiding force behind Jake’s Billiards, a Greensboro institution where, if everybody doesn’t know your name they certainly know your game. The only place I know where aging hippies and glorified hipsters party harmoniously alongside students, day laborers, architects, musicians, salespeople, you name it. An alchemic mix of disparates drawn inexorably, though not entirely by accident, to Jake’s Billiards. Originally known as Rack’m Pub & Billiards, a joint located on Battleground perpetually behind the eightball with (so the story goes) numerous Alcoholic Law Enforcement violations back in 1991, a smoky establishment rechristened “Jake’s” four years later after regular customer Jacob Segal acquired the place. After the expansion Jessie was equipped with a proper kitchen, able to prepare more adventuresome fare like Spicy Wontons (jalapeño, cream cheese, corn and grilled chicken), Angus Mushroom Swiss Burgers, Baja Tacos ($2 on Tuesday) and my persona fave, Cobb Salad (for less than 5 bucks). You know how hard it is to find an authentic Cobb Salad at any price? “We had a chef who was very creative,” she recalls. “The next thing you know we’ve got avocado aioli and mangos in here for mango salsa.” Just about everything, right down to the dips and sauces, is made from scratch in-house. It’s not uncommon for NFL athletes or touring musicians from the nearby Coliseum to blend in late night at Jake’s. I can’t think of anyone who doesn’t feel at home there and it all works precisely because of that peer-to-peer business model. Billy Eye can be found at the bar.